Your bathroom can sometimes be a neglected area of your home. However, an inviting bathroom can de-stress you after a tired day at the office or make an impact when guests arrive. Here are 9 bathroom essentials that will create an inviting space. Good lighting – Good lighting is essential for a bathroom since most bathrooms are used to apply makeup, blow dry and style hair. Good mirror – A fancy customized mirror will make your space seem larger and give you a good, accurate view of yourself. For those who want a full view of themselves, a long floor length mirror is a good addition. A matching set of towels – Luxury towels in good quality fabrics, make your bath experience a whole lot more enjoyable. Durable bath mat – A safe set of non-slip bath mats is a must, to reduce slipping mishaps and to keep your feet dry after a shower. Glass shower cubical – Gone are the days when shower curtains were Opt for a clear glass cubical that is easy to clean and looks modern. Good cleaning supplies- Choose good quality cleaning supplies that will help you keep your bathroom in pristine condition. Good storage solutions – Store your bath essentials like makeup, brushes, shaving foam in cabinets or on racks under the sink. Good window treatments – To maintain your privacy; choose a good quality window treatment. 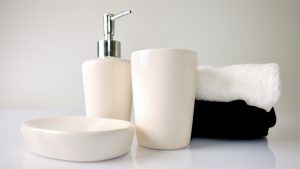 Toothbrush holder – To store your toothbrush and your toothpaste neatly, invest in a good quality toothbrush holder.